SONNY BOY® Uncrossing Action. Uncross Bad Luck and Evil Eye. Uncross Unexplained Pain. Uncross Trouble From All Directions. Make Uncrossing "X" with oil outside your door at home or work or wherever the affliction is showing itself. Make "X" in your right palm daily, with Uncrossing Oil, and pray Lord's Prayer. Don't skip a day, until you see a difference. This is a Holy item and works with your prayer. Sonny Boy says always use a kit for strongest action. SONNY BOY® Jinx Remover. Jinx Killer. Move the Jinx Out Of Your Way. Draw Your Number! Get Your Job! A Jinx is Real! Don't let anyone tell you it is not. 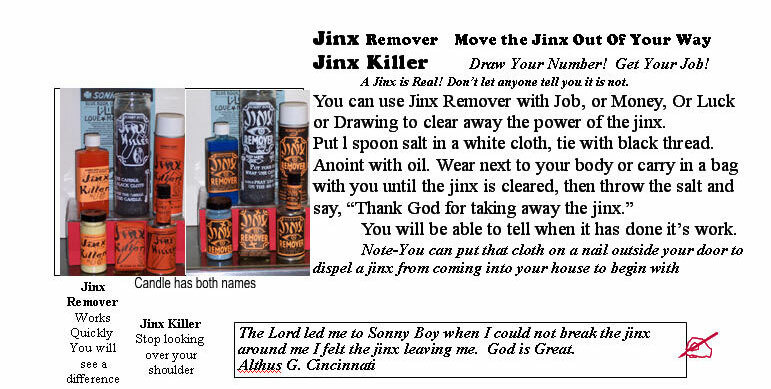 You can use Jinx Remover with Job, or Money, or Luck or Drawing to clear away the power of the jinx. Put l spoon salt in a white cloth, tie with black thread. Anoint with oil. Wear next to your body or carry in a bag with you until the jinx is cleared, then throw the salt and say, "Thank God for taking away the jinx." Sonny Boy says always use a kit for strongest action. SONNY BOY® Spellbreaker and Block Buster. Is a Spell Holding You Back? Do you know where it came from? You can pick up a spell or block without knowing it. l - Write the Spell or Crossed Condition you feel is holding you back on paper. 2 - Tear the paper in 7 pieces. 3 - Put the papers in a white cloth, place them under your bed. 4 - DAILY - Take out a paper, and anoint it with oil .Anoint yourself all over with the paper, then leave it somewhere. Sonny Boy says always use a kit for strongest action. SONNY BOY® Reversable and Turn Back. Bad Luck Reverse. Turn Around Bad Luck. "All my luck is bad. Nothing goes right for me. It's one thing after another"....in a letter from Jesse K., Nashville. 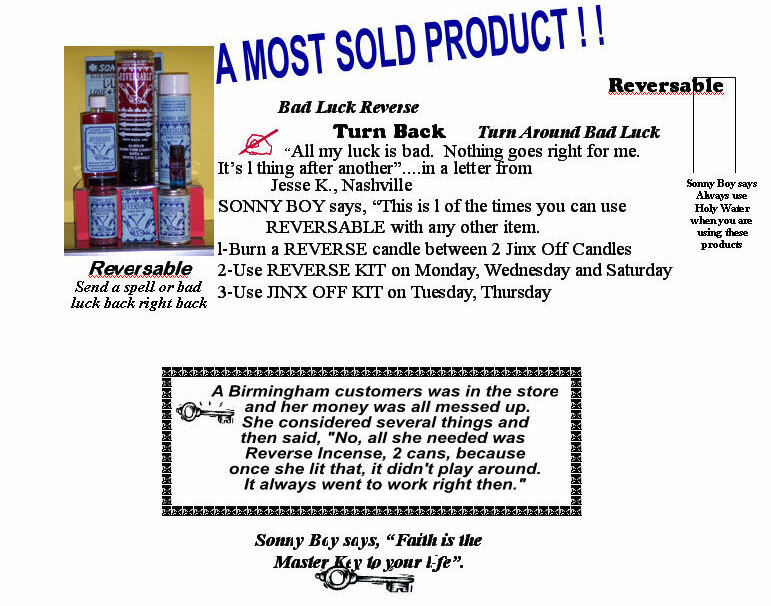 Sonny Boy says, "This is one of the times you can use REVERSABLE with any other item." l - Burn a REVERSE candle between two Jinx Off Candles. 2 - Use REVERSE KIT on Monday, Wednesday and Saturday. 3 - Use JINX OFF KIT on Tuesday, Thursday. Use all items, they have a purpose Reversable send a spell or bad luck back right back. Sonny Boy says always use a kit for strongest action. Sonny Boy is the #1 supplier of spiritual products and botanica. Strong! Dependable! 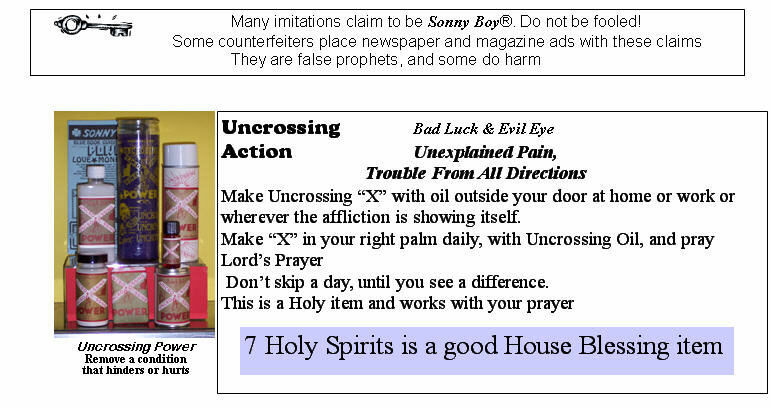 Sonny Boy spiritual product's ancient recipes for incense and oils are the most powerful. Burn Sonny Boy Novena Alter Candles allow your prayers to communicate your need for God's blessings. Sonny Boy Triple Strength Spiritual Products has the triple strength you need to remove the work someone has done on you, or to take away an unwanted condition you have picked up that you didn't know about. When you feel the effects of jinx or crossing, immediately begin your ritual and use any combination of Sonny Boy Uncross, Jinx Remover, Spellbreaker, Block Buster, or Reversing Condition items. Burn Sonny Boy Novena Candles, use the incense and oils and other items in the kits. You will draw the blessings you need.